For every genuine piece of Imperial period Russian enamelled silver there are at least 1000 fakes. This is one such fake. 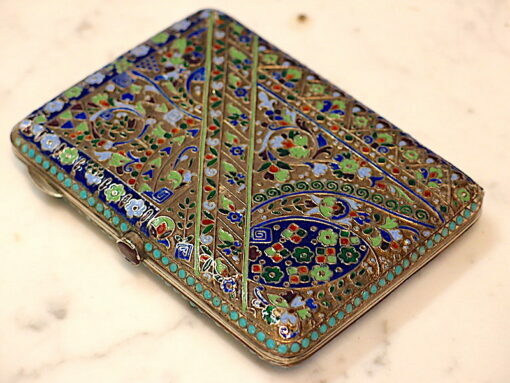 It is an enamelled cigarette case in 875 silver (really! ), hallmarked for Moscow 1899-1908 (fraudulently), but apparently with no maker's mark. Actually made in Russia about 1992, this hefty silver case weighs 322 grams. The thumb piece is a glass gemstone. Many original ones have glass thumb pieces by the way. 11.5 cm by 8 cm, by 2 cm. While not the same value as a genuine Nicholas II period example, these fakes still have a value. They are, after all, still enamelled, solid silver, of skilled craftsmanship. Many auction houses now list genuine examples in the front part of a catalogue and the fakes in the back part of the catalogue. Jacksons in the US is one such auction house. Nevertheless, in Australia, a much smaller and less sophisticated market, fake Russian silver is often is old at auction as genuine, and while the law states that a shop's receipt must accurately describe goods, auctions are not under such constraints. There is, in fact, no legal framework to allow, much less compel, auctions to guarantee their descriptions in Australia. Caveat Emptor. This cigarette case comes with a legally enforceable guarantee that it is fake. Rest easy! For every genuine piece of Imperial period Russian enamelled silver there are at least 1000 fakes. This is one such fake. 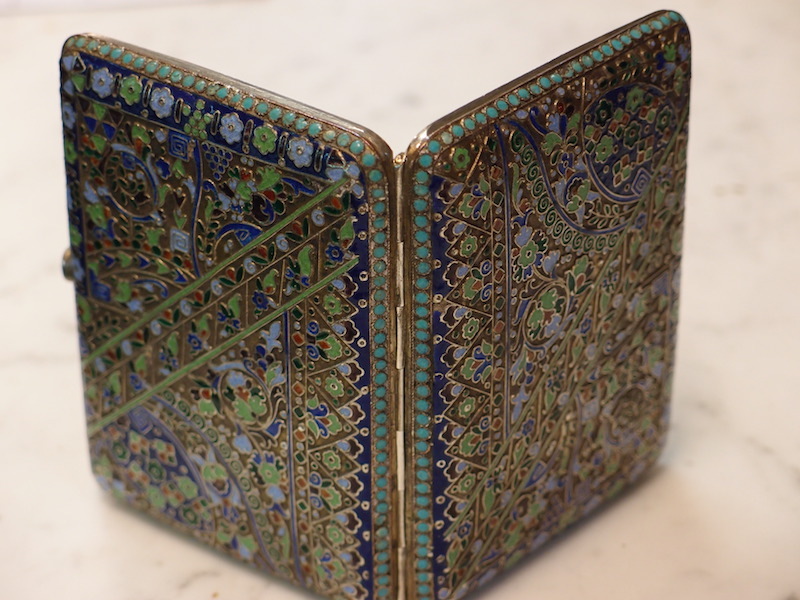 It is an enamelled cigarette case in 875 silver (really! ), hallmarked for Moscow 1899-1908 (fraudulently), but apparently with no maker’s mark. Actually made in Russia about 1992, this hefty silver case weighs 322 grams. The thumb piece is a glass gemstone. Many original ones have glass thumb pieces by the way. 11.5 cm by 8 cm, by 2 cm. While not the same value as a genuine Nicholas II period example, these fakes still have a value. They are, after all, still enamelled, solid silver, of skilled craftsmanship. Many auction houses now list genuine examples in the front part of a catalogue and the fakes in the back part of the catalogue. Jacksons in the US is one such auction house. 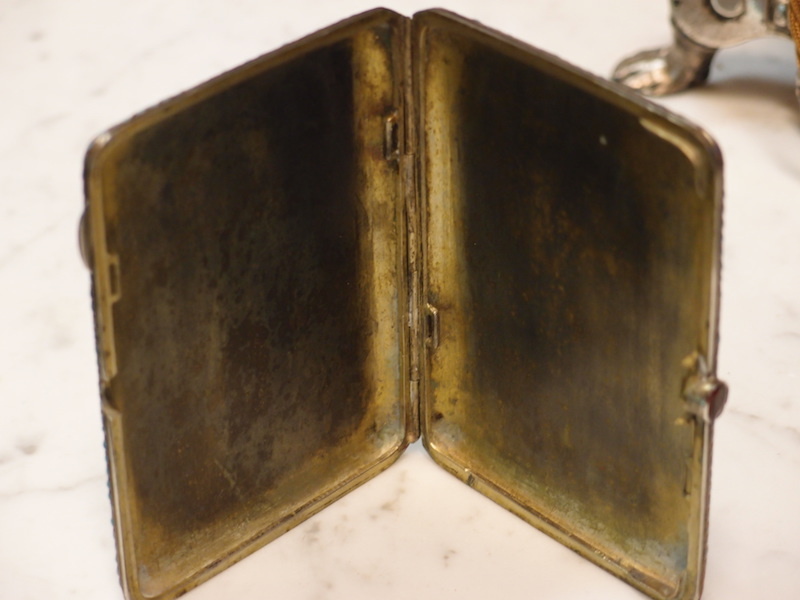 Nevertheless, in Australia, a much smaller and less sophisticated market, fake Russian silver is often is old at auction as genuine, and while the law states that a shop’s receipt must accurately describe goods, auctions are not under such constraints. There is, in fact, no legal framework to allow, much less compel, auctions to guarantee their descriptions in Australia. Caveat Emptor. This cigarette case comes with a legally enforceable guarantee that it is fake. Rest easy!